UNESCO-UNEVOC follows the United Nations’ stride in celebrating the World Youth Skills Day every year on 15th July, and reaffirms its commitment to enhance the prospects of the youth to access quality skills development through TVET, globally. UNESCO-UNEVOC’s theme for this year’s celebration was ‘Improving the image of TVET’. WorldSkills was proud to recognise World Youth Skills Day (WYSD) on 15 July 2018! Use #SkillsChangeLives and #WYSD to join WorldSkills and the United Nations, to raise awareness on the importance of youth developing skills. We believe #SkillsChangeLives. Through the power of skills individuals, communities, and countries are propelled towards a more prosperous future. WorldSkills International is very proud to be part of a global recognition and promotion of World Youth Skills Day. The United Nations, at its General Assembly in November 2014, declared 15 July as World Youth Skills Day. 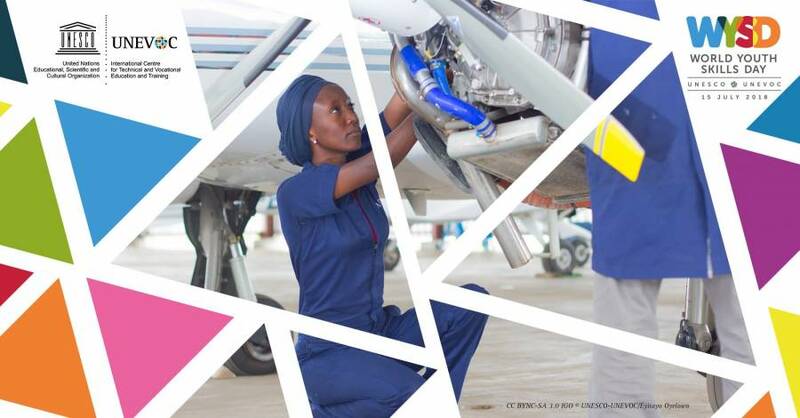 The UN designated day seeks to generate greater awareness of and discussion on the importance of technical, vocational education, and training and the development of other skills relevant to both local and global economies. It is hoped that it will contribute to reducing unemployment and underemployment among the youth across the globe. It will highlight youth skills development to draw attention to the critical need for marketable skills. WorldSkills will support this globally important topic via the broad spread of activities and initiatives in our 6 focus areas all aimed at raising the profile and recognition of skilled people and showing how important skills are in achieving economic growth and personal success. Inspiring, educating, and developing youth is an integral part of this. Are you a skilled photographer? Professionals or not, join our SkillsinAction Photo Contest! This competition is organised as part of UNESCO-UNEVOC International Centre’s activities in celebrating World Youth Skills Day this July 2018. The competition is open for everyone who is 18 years old and above. We especially encourage students and young people to partake on this event using your skills. The photographs should focus on highlighting examples and role models, such as students, junior workers, and young teachers/trainers, who are enabling the achievement of any of the above thematic priorities and illustrate a better image of TVET. The winners of the Skills in Action Photo Competition will win cash prizes along with certificates and their will also be featured on UNESCO-UNEVOC website and its social media platforms. Deadline for submissions is 31 July 2018, so grab your camera and find out how to send your pictures! Promoting equity and gender equality – showing how access to skills development should be for all young people and how skills development can overcome gender stereotypes and inequality issues. All photos must be submitted using the submission form on or before 31 July 2018 to unevoc.skills@unesco.org. Winning photographs and finalists will receive a certificate and their entries will be featured on UNESCO-UNEVOC website and its social media platforms in line with the celebration of the #WYSD (World Youth Skills Day). Make sure you read through the submission process before sending in your pictures! All photos submitted should be in jpeg format. The longer side should be at least 3,000 pixels. The entrants are allowed to digitally manipulate entries slightly and state the nature of manipulation. Please do not include any marks, logos, watermarks or borders in your photos. Add a title and write a short description for every photo. Send the completed form (with thumbnails of the pictures) along with the original photos files to unevoc.skills@unesco.org with the following email subject heading Last-name_SAPhotoCompetition2018. Note that the attachment size may have a limit. In case of multiple entries that cannot be sent via email, you can use any cloud storage servers you prefer and provide us the direct link (no signing up required) to download. Upon submission, UNESCO-UNEVOC will preliminary filter entries upon compliance of the basic terms and conditions. You may or may not receive acknowledgement receipt from us but rest assured that your entry will be processed. A notification will be given by email or by call to the entrants to inform them that their entries have been shortlisted. All shortlisted photos will be uploaded on UNESCO-UNEVOC Page on Facebook https://www.facebook.com/UNEVOC/. A date to announce the winner will be published soon. Often viewed as a second-class education, technical and vocational education and training has been subject to image debates for decades. Across the globe, TVET development has suffered from poor investment, quality and relevance. However, in a world where countries are facing high levels of youth unemployment, rapidly changing labour markets, technological advancements, and persistent social inequalities, the important role of TVET is increasingly being recognised. The orientation of TVET towards the world of work and the acquisition of employability skills means it is well placed to address global issues and it also has an important role in promoting sustainable development. World Youth Skills Day has become an official (UN Day) starting from 2015 and raises awareness about the importance of youth skills development. The need to campaign and promote World Youth Skills Day is more important than ever before. Despite the youth employment rate increasing compared to the previous year, the number of young people without a job remains over 10 per cent in many countries (OECD, 2016). Perhaps more alarming, the number of young people out-of-school and not in education, employment and training (NEETs) is increasing. At the same time, young people are also faced with the question how they will address their country’s current and future challenges. The 2030 Agenda for Sustainable Development calls for a shift towards more sustainable and equitable economies and societies, which will no doubt result in changes in the world of work and education. The UNESCO-UNEVOC International Centre specialises in technical and vocational education and training (TVET). It assists UNESCO’s member states to strengthen and upgrade their TVET systems with programmes and policies that are relevant, lifelong and accessible to all. Our aim is to promote learning for the world of work. We focus on three priority areas youth employment and entrepreneurship, equity and gender equality, and the transition to green economies and sustainable societies.